For the appearance of professional slate installation, this finish features shade variations simulating real slate. Vein textures also recreate the actual look of stone. The template features grouting lines that are finished with a darker, contrasting color to complete the final finish that perfectly simulates the sophistication of a slate floor. The traditional look of brick is always popular for walkways, patios and entries. It offers, perhaps, the greatest versatility in pattern and color options. Virtually any shade variation can be achieved to match a structure’s existing brickwork. Multiple patterned templates are available to best mimic the lay pattern already featured in a structure or outlying features. Traditional Face Brick: typical lay-pattern in structures. Herringbone: decorative, alternating lay-pattern popular in walkways. Jumbo Size: featured in many large, outdoor patio areas. Old Chicago: when a weathered, vintage look is desired. This finish is popular in industrial decor man-spaces as well as outdoor patio areas. The neutral tone of grey along with the functional texture of cinder block makes a statement without overwhelming the surrounding space. Always a favorite for its English country garden appeal, the rustic look of cobblestone looks great indoors or out. Irregularities in size and shade variations create the perfect aesthetics of real cobblestones. Contrasting grout features complete the look. Flagstone patterns always find themselves at home in cottage gardens as well as indoors, transforming a space into a showcase. Flagstone is the perfect complement to any decor. As versatile as brick templates, multiple color and shade finishes are available to complement any surrounding feature. Square tile flooring is perfect anywhere. Indoor spaces, patios, pool decks, walkways. This is a pattern that has withstood the test of time. It is a classic, not a trend. To use a template for a waterproofing deck finish with maximum appeal, the size of the project doesn’t matter. Whether it is a small space, like an entry stoop, or a space as large as a parking area that accommodates six vehicles, templates can create visual impact while also preserving a structural investment. Give a boring garage floor as much of a wow factor as an art museum lobby. If your imagination can conjure up the image, chances are a template, or a combination of templates, can deliver the dream. 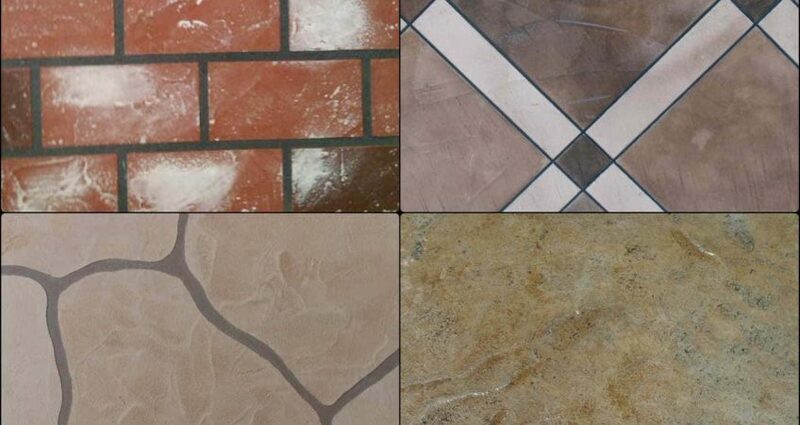 Mixing and matching templates to create a custom tiled pattern is possible. Options to mix complementary and contrasting colors for amazing visual appeal can transform a floor into a work of art. Varied texture options make it possible to recreate the look of real stone that makes a deck or floor become a treasure of marble, slate or granite. Dozens of pigment and stain choices assure project managers the capability of delivering the custom color a project calls for. Once the final seal is applied to a template project it becomes more than a thing of beauty. It becomes a durable surface to be enjoyed for years to come. Pli-Dek polymer products provide UV resistance against sun damage for outdoor projects in even the harshest environments. The proven application methods of this system’s products are designed to withstand even industrial level use while protecting substrates. These beautiful finishes will weather daily use while maintaining their color vibrancy. Ready to start your own deck finish project that will be as functional as it is visually appealing? Please contact us for a sample or any other resources to help you plan effectively. More than 35 years of successful service in the deck waterproofing industry means we have the experience demanded by any project, large or small.